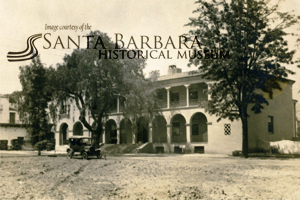 In 1880 a large number of Cordero families lived in the area east of what is now downtown Santa Barbara. This portion of an 1877 map shows the most likely locations of Cordero families (the 1880 Census does not include addresses). 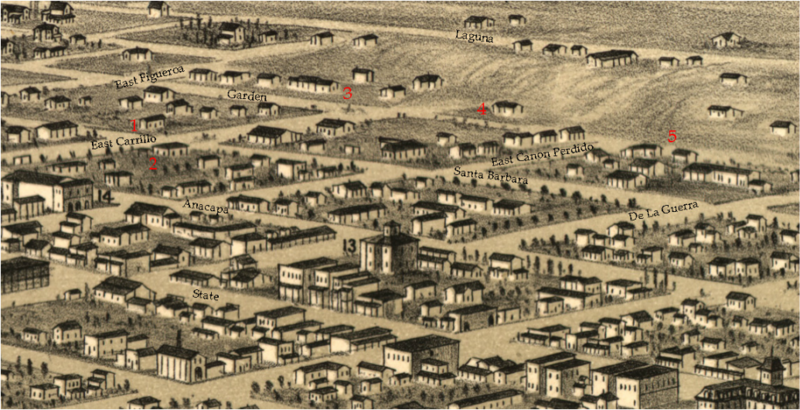 The Cordero individuals and families who did not live in this area in 1880 or whose location was unclear are listed at the bottom of the page. Over the next few years many of the Cordero families outside of the six-block area bounded by Figueroa, Laguna, Canon Perdido, and Anacapa streets would move to that area, especially block 154 (#4). 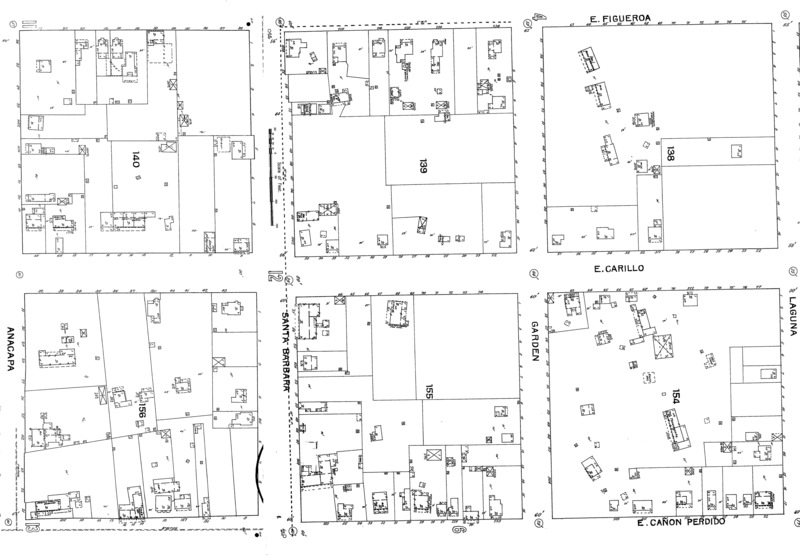 See the attached PDF of the 1892 Sandborn map to see the growth of the area. 1. Salvador Cordero and Manuela Cota. Directly across Santa Barbara street is the home of Manuela's father, Manuel Cota. ﻿2﻿. Although not in cluded in this painting, the original home of Ventura Pico (built circa 1830) should be here. Buenaventura Pico married Antonia Cordero (daughter of Juan de Jesus and Antonia Valenzuela). Also at this residence was Petra Pico Cordero, widow of Francisco de Jesus Cordero (son of Pedro Cordero and Dolores Quijada). 3. Jose de Jesus Antonio and Sinforosa Lugo. 4. This is block 154, obviously not yet developed, but by 1880 a large number of Cordero families lived here. The following families may have lived here in 1880: Antonia Valenzuela Cordero (widow of Juan de Jesus), Juan de Jesus Antonio, Jr. and Guadalupe Ayala Valenzuela, Mariano Cipriano Cordero and Viviana Valenzuela, Romualdo Cordero and Emerica Espinosa,Jose de Jesus and Refugia Espinosa. The Espinosa family lived in the northeastern portion of the block. 5. In this area lived Ascencion Cordero (widow of Juan Pena), and Jose Antonio Cordero (son of Miguel Cordero and Antonia Jimenez) and Refugia Espinosa. Further south along Garden lived Jose Antonio (son of Estanislao Cordero and Cirilia Ruiz) and Eduviges Valenzuela, and Lugarda Cordero Leyva and family. Francisco Cordero (Matias Cordero and Ygnacia Zungia) and Tomasa Rodriguez lived on De La Guerra with Tomasa's mother. Maria de los Dolores Cordero (servant) lived on East Canon Perdido with Inez Covarrubius. Jose de Jesus Cordero (Pedro Cordero and Dolores Quijada) and Juana Ruiz lived on Bath Street. Rita Garcia Cordero Salazar (widow of Gregorio Cordero) and son Geronimo Cordero lived on De La Guerra. Lucas Cordero (Juan de Jesus and Guadalupe Valenzuela) and Juan Cordero lived at separate locations in the Patera Precinct.